I am all out of synch posting here on a Tuesday afternoon. I still managed to get to Boc Boc though! Then he reminded me of this quilt which I showed him as it was in progress a few days ago. ( its still in progress by the way as you may have noticed by the missing heads!) He said that he liked the composition of the quilt and only then did I ask him could he see what was in my mind when I made it. He then started to look worried and eventually said that he saw an abacus. An abacus??? I looked afresh. Oh yes, in the brown fabric. Sort of. But why would three ladies be standing next to a giant abacus? I was thinking of ladies wating for a lift. The light dawned. 'That's what the two buttons are! I see it now'. So I suppose the answer to your question depends on what we mean by a quilt 'working' or 'succeeding'. If a viewer enjoys looking at it and can tell themselves a story or can be interested as a result of looking at it, that's success to me. I don't mind if what they see is not what was in my mind when I made it at all.But I also like that the title gives a new perspective. So double pleasure: the viewer's own interpretation and then their consideration of mine. I see the title as part of my creation. And I think a lot of other people find art more interesting or maybe more accessible if they have a key to help them enter into it. But then, I am a writer and words are as much art to me as the quilt. I really don't understand why the need to divorce the two if the coupling makes for a deeper experience. After all no-one said to Paul Simon " Nice music but you know, the story of the trip to Gracelands ought to be told though the notes and not need the words." 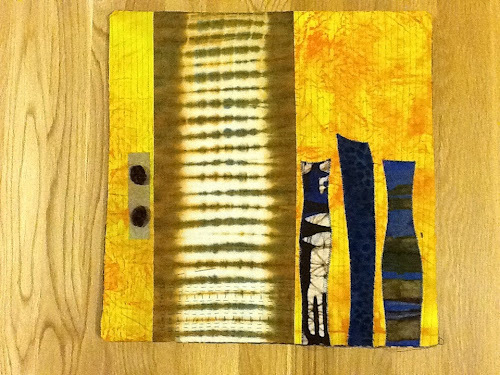 I agree that a good title is not going to make up for a dreadful quilt design but I do believe it can enhance a quilt. I also read recently an email list discussion about writing artists statements in which someone decried putting too much about the art piece in the label next to it in a gallery else the art would end up 'just illustrating your words'. I recoiled at that one. What is wrong with that? Served Beatrix Potter quite well if I recall. Actually, it deepened still further a latent desire in me to produce a book in which photos of my quilts go along side pieces of my writing on the same topic. An idea for the future! To pick up your issue of design methods - aimless experimental wandering, or purposeful wallk towards a preconcieved idea, I do a bit of both. Sometimes I shuffle fabric and the process of doing that inspires me. Or I start with an idea and work towards that happily going off on a tangent if I am so led to do so. I was very interested in that same Quilt Art 22 catalogue to read that ?.......... Whose work I very much admire says she also uses both approaches. I think that disappointment is possible with both methods. Either the meanderng leads nowhere or the preconcieved idea turns out to be an unreachable pot of gold under the rainbow. On another note, I read an interesting article by ..... In the SAQA Journal about how keeping a journal/ sketchbook was not for everyone. She had tried both it and journal quilting and found it only distracted from her actual art making. I had to smile because I know both you and I have had the journal trauma of believing that if only we could find the perfect method of journalling, that would transform us into an awsome quilter. ( Am I right? I worry now that I just made that up and it was only me had that belief). Anyway, all the time I/ we have been having that internal conversation I have actually been keeping quilting journals. Of the kind that work for me. In which I often write about how I need to try another ( much less natural) way of art journallng. How nuts is that? At the moment they are all stuffed temporarily into my wardrobe awaiting official studio space. So I pulled one out at random. The first page had a postcard from Marrakech which I stuck in in 2007. It was just the inspiration I didn't know I was looking for, for a quilt based on fruit I promised to make for an exhibiton at Midsomer Quilting. ( I will show you as soon as it is finished and the good folk at MQ have seen it which will only be a few days off now. I plan something a little dfferent and as they read my blog I dont want to spoil the first viewing!) So my wordy journals with narry a spot of paint in them can be just as useful as those mini works of art books produced by fine artists turned textile workers. That said, I still get seduced by possibilty. My next letter to you will no doubt come from Bath as we go down there next week and I have my pile of starter books ready ( others wil be bought down there) including two by Danny Gregory which, even without opening them, are tempting me to buy a watercolour moleskin and keep a visual journal of the trip. Not for design purposes. Just for fun. And the excuse of buying a new moleskin! 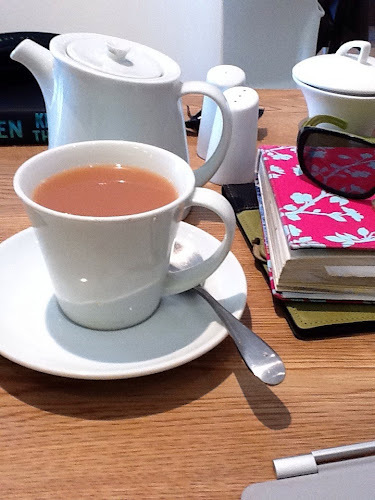 So how are you getting on with your tea theme? Maybe there is a subconscious link between your iced tea and yor ice dyed fabric?! Are you by chance going to use the SAQA visioning project this year? I am just filling in my page this week so I'll tell you more about that next time I write. But now it is time to go home and take one or two missing photos to add to the text above so I can post this. Then to get to work actually being creative!! I think titles are necessary when, as you say, "the coupling makes for a deeper experience." I love it when I look at what appears to be an obtuse work of art, then read the title, and a door of understanding opens. It's a wonderful experience. Recently I've been working on a piece and I knew the message I wanted to convey. Alone, the work would have needed to be annoyingly literal to convey the message, but the combination of a more subtle work plus it's title added so much more understanding to the piece (IMHO).